1. Bandeau Bikini (Roxy, on sale here). Makes tanning without strap lines so much easier. 2. Chambray Button Down (Madewell, here). Seriously my favorite casual top and the perfect cover-up. 3. Panama Hat (J.Crew, here). 4. Folding Wayfarers (Ray-Ban, here). I love my sunnies. This is my everyday and travel favorite. They are compact, timeless, and just hold up so well no matter what I'm doing. 5. Capri Sandals (Old Navy, here). A classic made even more comfy with cushy padding! I prefer these over the J.Crew ones which tend to hurt my feet. 6. Ombre Beach Towel for Two (Target, here). I love how this is over sized and the print reminds me of the ocean. 7. Canvas tote (Old Navy, here). A perfect pop of neon and such a great price! 8. Sunblock, Aveeno Hydrosport. While I love to work on my tan while at the beach, I'm pretty serious about skin care and sun protection. This works so well for my sensitive skin. 9. Tanning Oil, Maui Babe Browning Lotion. I discovered this during a trip to the Bahamas a few years back and have been obsessed ever since. I tend to burn and it's hard for me to tan, this is HG material in my book. 10. Tinted Lip Balm, Neutrogena Revitalizing Lip Balm. Perfect pink tint, plus much-needed SPF for the most neglected part of the face! 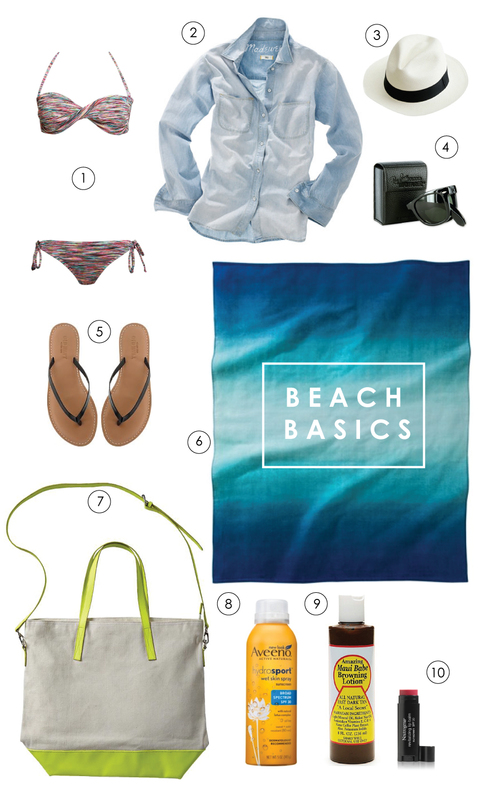 I would love to hear what your beach list faves are!